One of the quirks of living in a rainforest that's bordered by ocean on one side and ice fields on the other is that you learn quickly to rely on alternate modes of transportation - like the ferry system - for fresh veggies for your dinner table. This week, because of an electrical malfunction on the Alaska Marine Highway System's M/V Columbia, Juneau's largest grocery store found herself with empty fruit and vegetable stands. Fortunately, the disrupted service is just temporary. This certainly isn't the first time this sort of thing has happened. 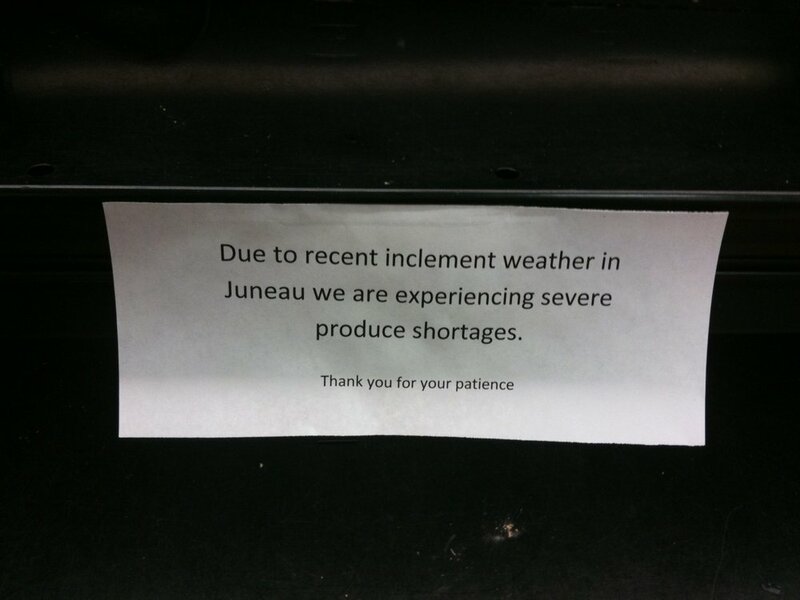 Juneauites usually experience a few shipping disruptions each winter because of inclement weather. The photo below is an example from a few years ago, when I experienced a "veggies shortage" for the first time. Thankfully, rainbow chard and raspberries will be back before we know it.